Discussion in 'Gaming (Software and Graphics Cards)' started by Mobius 1, Jul 14, 2012. I've read that almost all people here have problems on overclocking the Kepler series mobile GPU's. So I'd thought why not make a thread for it where you can get ALL the info you need. I can't say I have a Kepler though, I have a 630M that is basically a rebranded GT 540M. So, enough with the non-related stuffs for now. Let's dive right it. What this guide will have. I know some people here like svl7 from Tech|Inferno and NBR and Prema from and NBR and BIOS-MODS forum likes to mod and change settings with the BIOS of videocards. If you people happen to have a vBIOS dump (GTX 660m/680m), or a BIOS dump of your system (GT 640 D3/D5, 640LE, 650 D3/D5). Please post them here so both svl7 and Prema can mod it. First would be updating your drivers, as usual go to the nVIDIA website and download your preference (latest BETA or STABLE). Windows power management: Set both min CPU usage and max CPU usage to 100%. 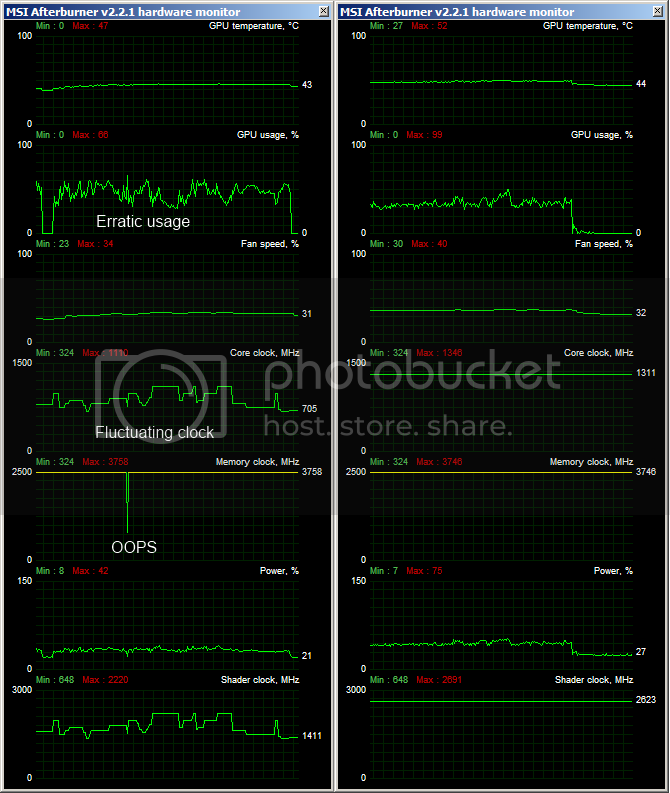 Change all cooling method to "active"
Please use throttlestop by unclewebb. Disable BD Prochot. Dynamic boost= Biggest failure of 6xx series, not automated hardware can beat a human operator in overclocking a graphics card. P2 = the default mode used when your PC boots or no drivers are installed. The command line is required to do this. Either run "cmd" and locate the directory containing nvidia inspector, or create a .bat file in its directory. Create the following batch files in your Nvidia Inspector directory. Would just like to add, to make it easier for other people. -setGpuClock:0,0,970 some people might know already, but the number in bold, the first one represents which gpu it's applying to, 0 for the 1st gpu and 1 for the 2nd gpu (if u have one) and so on. -setGpuClock:0,0,970 the second number in bold, represents the performance level the clock is applying to, 0 would be performance level 0 (pstate 8), 1 would be level 1 (pstate 0, for me), for others it might be pstate 2 or 5, if so then performance level 2 would be pstate 0.
and of course the last number being the target core clock. But as i'm undervolting it in pstate8, i put -setGpuClock:0,0,970. It's the same for setting the memory clock. The commands above are self explanatory. Simply adjust the offsets/values to suit. I use shortcuts to execute these batch files, making idle<->overclock an easy toggle. Even with forced idle clocks, blurays only use 20% gpu. This is where it gets to the point where you have to at least figure out something on your own. The command line of the P-state, is not only 0,x as stated above for the desktop GPU, it might need a different value. Thanks to "Mobius 1" on Notebookreview to point out a program called NvidiaInspector for overclocking. Using the following guide, I am able to OC past the clock of 1035. The only difference, was that to get into P2, I had to type in nvidiaInspector.exe -forcepstate:0,1 instead of 0,2. This might be the solution to: DDR5 GT 650M users in the DvT6, Alienware M14x (R2), Sager NP616/75 (W15/70ER). DDR3 650M users (sheesh, really DDR3 in 2012?) in the W110ER and N5/76VZ might work, but no confirmation yet. However it needs proving by somebody using 0,1 in the above stated laptops. This however, is done on a LENOVO Y580 card. NVIDIA GeForce GTX 660M video card benchmark result - Intel Core i5-3210M Processor,LENOVO Product Name score: P2949 3DMarks - 1200 MHz Core i 1250(2500) MHz Memory. NVIDIA GeForce GTX 660M video card benchmark result - Intel Core i5-3210M Processor,LENOVO Product Name score: P3019 3DMarks - 1230 MHz Core i 1250(2500) MHz Memory. I also needed to type "forcepstate:0,5" otherwise it didn't work, because it's this "P5" am i right ? Alienware M17x R4/R3 (assuming you got the 660M to work), Clevo P15/70EM, LENOVO Y580, ASUS G5/75 series. Using -resetAllPStates command does not work correctly. Reverting to default P mode can sometimes, depending on what you did, lock your card at a specific clock speed. Simply reinstall drivers to fix (clean install not required). There is a 1-2% performance loss using this method. I have no idea why. Stick to normal overclock methods if you want high benchmark figures. Will keep visiting for more update. Kingpinzero ROUND ONE,FIGHT! You Win! I hope my guide comes handy. Been using the clean method since a lot of time now and never had a driver installation issue. Just wondering, did the guide work out for you 640M LE? You, sir, are a godsend. I have an HP dv6t-7000 with an 3610qm and a 2GB 650m DDR5 and I was successfully able to overclock the core past 970 mhz! I've been looking for a way to do this for several weeks. You might want to add this to the OP: I can confirm that using a shortcut to force the pstate worked perfectly. However, similar to the other user, I had to put NVidiaInspector.exe -forcepstate:0,5 instead of 0,2 because the middle state for my laptop is P5. 1150mhz core/2800mhz mem (with throttlestop): P3030! Hai gaiyz, leetz scorez . It worked for the np6165/w150erq. Using 1202.3 mhz core. The memory wont go over stock though @ 2000mhz, wont even go 1 point above 2000, in p5 or p8. p0 (normally heavy load) you can't unlock max, so i just used p5, unlocked max set clock, and forced state. Thx for sharing this wonderful info. Can you help me fix the memory being not overclockable? (Its normally overclockable using MSI afterburner). LOL wait what. You can overclock GT650M almost up to GTX 580M? Na, 580m 3dmark11 stock gpu is about 3191, mine is only 3066 .